Cott Corp. is the world’s largest supplier of retailer brand soft drinks, and the fourth largest nonalcoholic beverage maker. Given the recent growth trends in private label, Cott should be doing well. Unfortunately, in 2006, when faced with slowing growth and shrinking margins, instead of striving to become a better and more efficient producer, the company abandoned its historical business plan and entered the uncharted territory of enhanced waters and energy drinks – with its own brands. This plan failed miserably: Cott alienated its core retail customers; healthy profits turned to losses; and debt mounted to the point that the company can barely service it. In May 2006, Cott’s board pushed out its CEO, John Sheppard, who had built EBITDA to roughly $200 million through acquisitions and a focus on efficient manufacturing, and brought in a new CEO, Brent Willis, to execute the new plan. From then until March 2008 when Willis departed, Cott’s stock dropped from $15 to $2 per share, wiping out nearly $1 billion of equity value. Today, it trades at around $1.00 per share, less than tangible book value. As I explain below, this could be an $8.00 stock if the company successfully implements its plan to cut costs and return to its roots. But it is a long, long way from here to there. If the company does not get capable leadership soon, it may never get there. Activist investor Crescendo Partners must have seen the upside opportunity when it purchased 8.7% of the company’s stock between March and May of this year. Crescendo installed four new directors and proposed that the former VP of Canadian Operations and Global Sourcing for Cott, Csaba Reider, become CEO. Crescendo then pushed the company to slash costs and get back to basics. On June 19th, the company announced its plan to increase cash flow by $39-43 million by refocusing on its core business, cutting G&A expense, and improving the efficiency of its bottled water operations. The cost cuts started with the elimination of several senior executives. Unfortunately, the damage done by Cott’s management may have been worse than even Crescendo realized, and the path to profitability looks pretty long and bumpy. It may take complete board control, not just the influence of an activist investor, to steer this company back into the clear. With debt approaching 5x run-rate EBITDA – and 8x run-rate EBITDA less normalized CapEx – the company’s balance sheet may force some sort of recapitalization, or reorganization, before the company is able to execute this plan. Cott’s $269 million of 8% Senior Subordinated Notes are due in just over three years. Its new ABL facility ($131 million drawn as of 6/28/08 ) also comes due at that time if the 8% Notes are not refinanced before then. The 8% Notes, which were recently downgraded by both S&P and Moody’s and trade at a significant discount, will not be easy to refinance. A patient lender, with confidence in management, would give the team the runway to execute a turnaround. But who would trust this team? The quality, consistency and transparency of its financial reporting, the reliability of its communications to investors, and the execution of its current turnaround plan have all been disappointing. It’s hard to believe in a company when you can’t rely on its financial statements. Cott’s auditors have sited significant internal control issues affecting the accuracy of its financial statements, and state that “management oversight… could not be relied on to mitigate [these issues].” Recent events indicate that despite management changes earlier this year, things have not gotten better. In its second quarter earnings call on July 31st, management said that it expected “adjusted operating profit” for 2008 to be 50% to 70% above 2007’s figure of $36.3 million. On the call, an analyst challenged this assertion, stating that given that adjusted operating profit for the first six months was approximately zero, “something fairly heroic has to happen in the next six months” to meet those projections. Management defended its position. However, less than a month later, on August 26th, the company said it would not hit these targets and revised its 2008 guidance downward dramatically, saying that adjusted operating profit would range from down 5% to up 28% versus 2007. I think this is still optimistic. On July 31, management said that the reduction in shelf space at Wal-Mart didn’t seem to be having a material negative impact on sales; that they were on track to deliver their cost savings plan; that their “water project,” which was to deliver over half of the roughly $40 million in cash flow increase from the turnaround plan, was going smoothly; and that they and a commodity cost advantage over their competition this year. By August 26th, they said that the sales decline was more severe than anticipated due to heavy promotional activity by competitors; their savings targets for this year would not be met; the water project was hampered by cost overruns and delays; and commodity costs were squeezing margins. Cott needs to move immediately to assure its customers that it is a capable, long-term partner, and assure its lenders and investors that it has a handle on its business. This means hiring a CEO who will inspire confidence, and making the other management changes necessary to insure that the company can provide some reliable visibility into its future performance. It is not clear that Crescendo’s CEO candidate is the right person for this situation. Rather than somebody with no prior CEO experience, I would like to see a seasoned company leader with real turnaround experience at the helm. If the company does not act quickly, its customers and lenders will lose confidence completely, taking the company into a downward spiral from which it may not be able to recover. Its retailer customers need a manufacturer for their store brand beverages, but Cott is not their only choice for private label production. Dr Pepper Snapple Group (NYSE: DPS) and National Beverage (Nasdaq: FIZZ) also have meaningful private label operations and capacity. It is not clear if they have enough capacity to service Wal-Mart and all of Cott’s other customers, but if Cott were to lose Wal-Mart, DPS and National Beverage could buy whatever additional capacity they needed from Cott’s lenders for pennies on the dollar. At this price, the enterprise value is 5.4x my estimate of adjusted EBITDA for the twelve months ended 6/28/08, and 5.7x my estimate of run-rate adjusted EBITDA (see “Financial Summary” below for EBITDA calculations). If one believes in the turnaround, the price is low, because it is only about 4x pro forma adjusted EBITDA after turnaround savings. If one has completely lost faith in management, the price is high and does not reflect negative sales trends and significant default risk. The current market price seems to suggest that the turnaround upside and default risk downside roughly offset each other. If confidence is not restored soon, default risk may become the dominant issue, in which case the stock price should go below $0.50 per share. At $0.50 per share, the company would be valued at about 5x adjusted EBITDA. One could argue that even this multiple is high, and that the company is not worth more than its debt, but I won’t go that far. The replacement value of its manufacturing assets and the value of its rights to the RC Cola brand internationally should put a floor on the equity value. Cott needs $40-$50 million of additional EBITDA right away just to get its leverage down to a comfortable level. Thus, the maximum $40+MM of savings from the turnaround plan MUST be achieved ASAP. To make success more certain, Cott should target deeper cuts in the primary controllable cost: G&A. Instead of sizing G&A to where the company wants to be, it should size it to where it is headed today. The planned G&A cuts should be $30MM, not $20MM. This will provide more certainty that the total savings can be achieved soon even if the operational/COGS fixes take longer than planned. The company needs to adjust not only head-count, but also salaries and board fees. Last year, the board of directors paid itself a whopping $1.8 million in cash director’s fees. The interim CEO, David Gibbons, is being paid at a rate of $850,000 per year (including directors fees), plus a grant of 720,000 shares of stock. Their current CFO made $800,000 in total comp for 2007. How can this be justified? Crescendo’s CEO candidate has agreed to work for a salary of $625,000 and a bonus of up to 100% of salary. How about a salary of about $400,000 and a performance-based bonus plus stock options to make up the difference? Cott needs a leader who will bet his paycheck on his performance. The Upside – Possibility or Pipe Dream? With $40-$50MM of additional cash flow – initially driven by G&A cuts and later by the “water project” and improvements in the company’s business model – EBITDA could get to $120-130MM and debt would be reduced to below 3.5x EBITDA (see “Financial Summary” below). With a return to growth and profitability taking the EBITDA multiple up to 8x, the company’s stock could be worth $8.00. But without new leadership, this seems like a pipe dream. The way things are going, it seems more likely that weak revenues and cost overruns lead to a cash crunch, which could lead to a death spiral. Now is the time for action by an industry acquirer, or a private equity group with the ability to capitalize Cott properly. Several other firms have circled Cott in recent years, but now this deal may have gotten too small for them. Likely strategic buyers are National Beverage and Dr Pepper Snapple Group. DPS is still highly leveraged after its “demerger” with Cadbury and has a number its own issues to deal with, so FIZZ, which has no debt, is probably the better acquirer at the moment. Cott would also be a great fit with Polar Beverages, which has a strong position in the Northeast. Ralph Crowley, Polar’s CEO, has a good eye for a bargain. Below is a summary of historical income statement data, along with my estimate of run rates as of 6/30/08, including adjusted operating profit, and my view on adjusted EBITDA. I have added a pro forma run rate adjusted EBITDA figure, factoring in management’s expected savings from the turnaround plan. The market seems to be anticipating adjusted EBITDA in the mid-$80MM range, but an EBITDA of $125MM or more seems to be within reach. If Cott had the right leader, it would be a lot easier to imagine that possibility. At the moment, it seems easier to imagine a restructuring. (a) Annualized by applying 6-month growth rate to 2007 full year figure. (b) Annualized revenue multiplied by the ratio of LTM COGS to LTM revenue. (c) Equal to LTM figure. In the Q2 earnings call, management said that capital expenditures should be $30-$35 million next year, excluding the “water project.” I assume this is “normalized” capex. In my Financial Summary, I estimate the run-rate adjusted operating profit to be approximately zero as of 6/30 based on year-on-year trends. Given the lack of progress on operational improvements and continued deterioration in revenue, I think that 2008 adjusted operating profit is more likely to be down 100% than down 5% as predicted by management. Cott management said that the “water project” would take their water business, equal to 17% of North American revenue, from a zero gross margin to a “fair” gross margin. If one wants to be long in this sector but does not have the stomach for Cott, National Beverage could be an interesting pick. 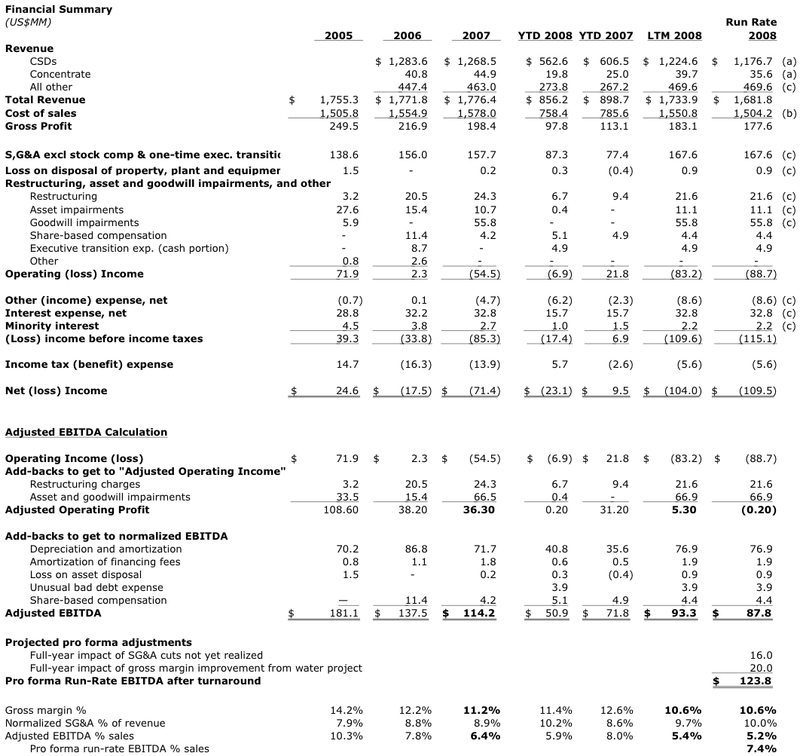 It has steady cash flow and no debt, and trades at about 7x EBITDA….